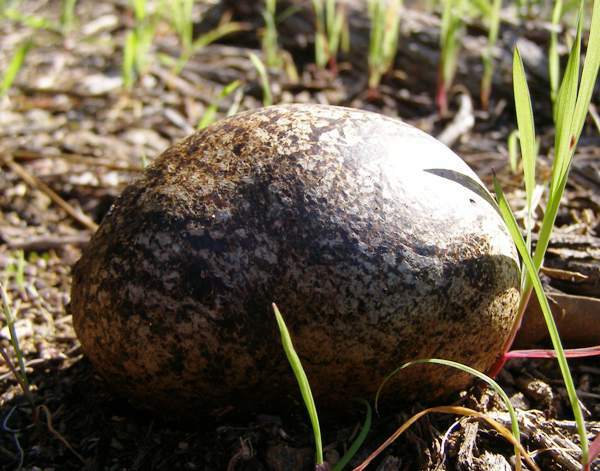 When young, the earthball fungus Pisolithus arrhizus is shaped rather like a rugby ball. Its traditional use as a source of dye led to it acquiring the common name Dyeball. Because it forms mycorrhizas with almost any kind of root, this ectomycorrhizal fungus is frequently used by foresters (and in recent years by gardeners, too) as the basis of a soil inoculant to promote tree and plant growth - particularly in remediation of areas of degraded or polluted land or formerly clear-felled forest sites. Progressively from the top, the whole of the fruitbody turns into a soft mass of brown spore-bearing powder. At maturity cracks appear in the upper surface and the spores blow away on the breeze or get washed away to new locations in wet weather. The Dyeball shown on the left has split and is just beginning to release spores. In dry climates the process of spore-distribution and decay of the outer case of a Dyeball can take several months, and so as brown powdery blobs these fungi are visible throughout the winter. Rare in Britain and Ireland, Pisolithus arrhizus is very common in southern parts of mainland Europe. The Dyeball also occurs in the USA, where two of its many common names are Dead Man's Foot and Dog Turd Fungus. The specimens pictured here were photographed in the Algarve region of southern Portugal. The immense power of coordinated hyphae is evident when you see a Dyeball pushing its way through a tarmac-covered road. Hitting one of these unexpectedly comes as quite a shock. 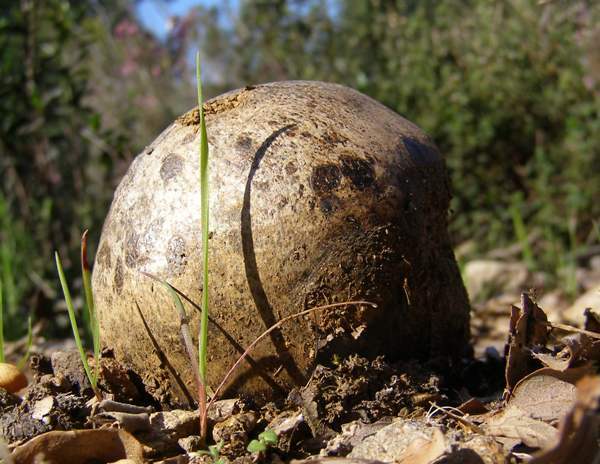 The Dyeball fungus was described in 1786 by Italian mycologist Giovanni Antonio Scopoli. Treating it as a puffball, Scopoli gave this fungus the binomial scientific name Lycoperdon arrizon. 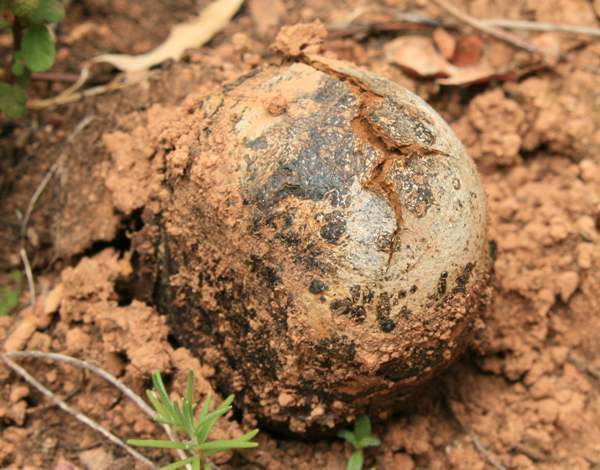 In 1801 Christiaan Hendrik Persoon retained (but with an 'h') the specific epithet when he included this species with other earthballs in the genus Scleroderma. From 1928 this fungus was known (and still is in some modern field guides) as Pisolithus tinctorius - that specific epithet referring to its use in dyeing fabrics. It was not until 1959 that the Dyeball became generally known by its current scientific name, which was proposed by German Stephan Rauschert (1931 - 1986). 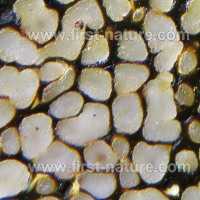 Synonyms of Pisolithus arrhizus include Lycoperdon arrizon Scop., Scleroderma arhizum (Scop.) Pers., Scleroderma tinctorium Pers., Pisolithus arenarius Alb. & Schwein., Lycoperdon capsuliferum Sowerby, Polysaccum olivaceum Fr., Polysaccum pisocarpium Fr., and Pisolithus tinctorius (Pers.) Coker & Couch. 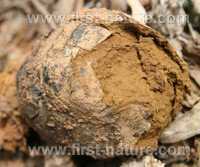 The generic name Pisolithus comes from two Greek words: Piso- meaning a pea, and lith meaning a stone, while the specific epithet arrhizus means 'having no roots'. Pisolithus arrhizus therefore translates to rootless pea-stone. The common name Dyeball certainly seems to say rather more about this fungus than its scientific name does. Often ellipsoidal or ovoid, especially when young, sometimes the fruitbodies develop a rudimentary stem as they mature, but unlike some puffballs the entire contents of the Dyeball consist of fertile spore-bearing material. Specimens usually range in size from 5 to 10cm across, but a very large one can be 20cm across its largest (often the vertical axis) dimension and may weigh nearly 1kg. Initially the inside (known as the peridium) of a Pisolithus arrhizus fruitbody comprises many separate compartments (like rice grains or peas squashed together) known as pseudoperidioles, within which the fungal spores develop. Eventually the thin walls of the pseudoperidia break down to release the spores, which escape from the fruitbody once the outer skin splits and crumbles. 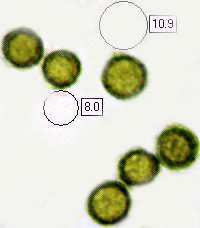 Spherical, 7 to11.5μm diameter; ornamented with warty spines up to 2μm tall. The whole of the fruitbody becomes a brown powdery mass, so the term 'spore print' is inappropriate - just place a tiny pinch of the snuff-like powder if you want to make a spore slide. 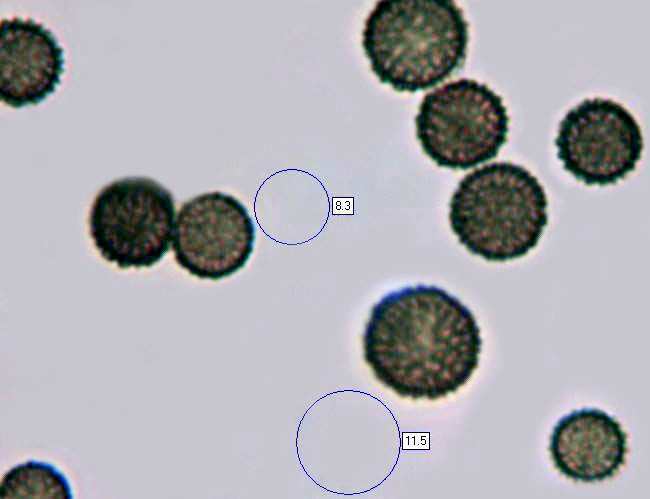 The spores are mid brown when seen in mass. Pisolithus arrhizus is mycorrhizal and most often found with trees in soft sandy soil, particularly in coastal pine forests but I have also found them more than 10km from the coast. 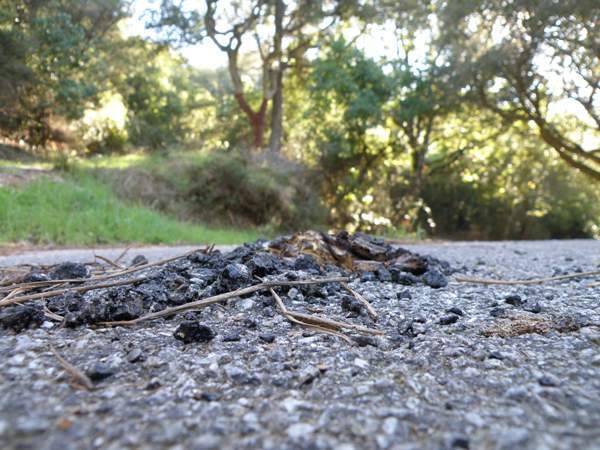 These are amazingly powerful fungi: I have seen the Dyeball fungus pushing its way up through an asphalt-surfaced road and creating a hazard even more dangerous than a deep pothole! Summer and autumn in Britain and Ireland; continuing through the winter months in southern Europe. Much more likely to be mistaken for horse dung than for another fungus. Rhizopogon luteolus (a false truffle fungus) is smaller and much paler; it, too, is mycorrhizal with pines but is more common in colder northern parts of Britain and mainland Europe. In common with other fungi in the family Sclerodermataceae, the Dyeball is not edible and it may even be poisonous. This 20cm diameter Dyeball Fungus (above) seen in southern Portugal does not look at all appetising. Martin, F., J. Díez, B. Dell & C. Delaruelle, 2002. Phylogeography of the ectomycorrhizal Pisolithus species as inferred from nuclear ribosomal DNA ITS sequences; New Phytologist 153: pp345-357.